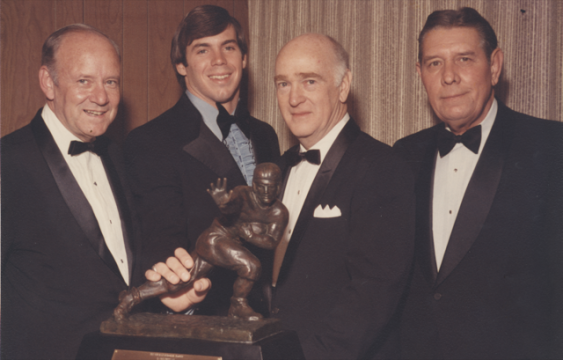 Back in April, Kenny Smith went to Samford and sat down with Pat Sullivan—Pat Sullivan the Heisman Trophy winner, Pat Sullivan the cancer survivor, Pat Sullivan the head coach at Samford, Pat Sullivan the person. It was the end of spring football, and players and coaches were ready for a little break. But the spotlight never stops shining on legends. Enjoy. 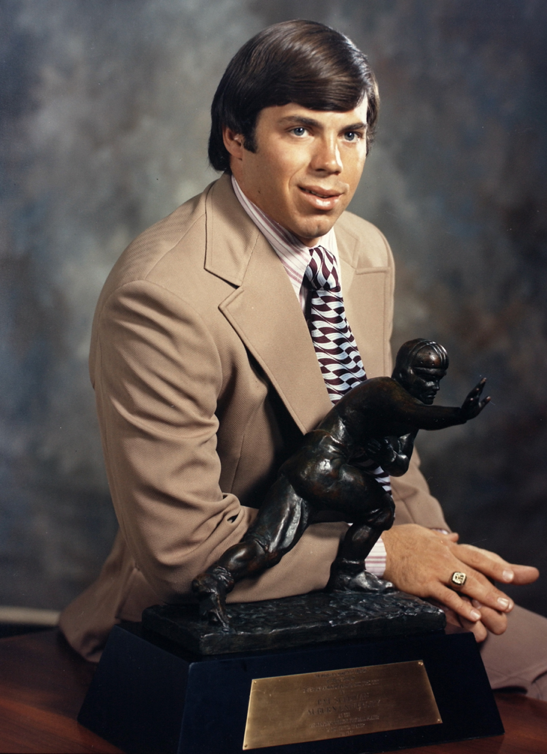 In 1971, Pat Sullivan became Auburn’s first Heisman Trophy winner. Eat your Ivy League heart out, Ed Marinaro. Forty years is a long time to be a sports hero. Pat Sullivan has been doing this for a long time, and does it with the grace and ease of a Southern gentleman. If you haven’t been following his career: after his last stop at Auburn as a quarterbacks coach (1986-1991) he spent five years at TCU as the head coach, ran seven campaigns as the offensive coordinator at UAB and has been the head coach at Samford University in Birmingham for the last five years. Now, at 61-years-young, his passion for the game is as strong is ever. His grip could still make a stone wince. If you have been following Sullivan from a distance, the answer to the first, most important, question is good news after his medical scare. Sullivan was diagnosed with throat and base of the tongue cancer seven years ago. When someone puts odds on your survivability the awards don’t matter, he said. What matters are faith, family and health. His inner-strength served him well. He beat cancer and only missed one game during his treatment. The whistle is tucked away for the summer, it was the day after the Bulldogs wrapped up their spring practice, but a coach’s job is never done. He was conducting exit interviews with his players around our conversation. “We’re on a fine line. We need everybody to have a good summer. We need our freshmen to come in. If everything could fall into place I think we could have a good football team,” Sullivan said. Sullivan was relaxed in his office, which still feels new. There are framed portraits waiting to be put on the walls. He works out of the handsome new field house at Seibert Stadium on the Samford campus, not too far from where he attended high school. This is home. He looks upon the stops in his career with gratitude, but he’s happy to be here. “It’s been very special to me. My father came to school here. He played on the first (then named Howard College) football team. He was struggling with cancer about the time I got the job. It was special to be able to come here,” Sullivan remembers. Bringing in the Auburn-great was the start of a significant chapter in Samford sports history. The Bulldogs soon joined the Southern Conference and now lines up against schools like Chattanooga, The Citadel and Appalachian State. “It’s where I wanted to come and try to do something that you could be proud of. We changed conferences. We’ve built up our facilities. We’ve really raised our level. We’re not there yet, but we’ve made tremendous strides. I’m excited about our future and where we’re headed. It’s just taken a little while to get there,” Sullivan said. And in that space between here and there, Sullivan is content. There was a game film running on his television screen. Family photographs rest in neat frames on furniture behind his desk. There are six shelves across from his desk, stocked with books and pictures. Two helmets are displayed, one a Samford helmet and the other from the Denver Broncos. If he’s not studying film, or sitting at the small round table for close conversation, he can glance at five footballs dotting the room, each with their own memories. When he left Auburn at the beginning of 1992 he headed west, to TCU. The Horned Frogs at that time, he said, were nothing like the Rose Bowl team you see now. That first spring he counted 53 players at practice. They ran their drills on the intramural fields, because they had no other alternative. During recruiting season they locked up the weight room. They didn’t want to show it to recruits. And yet he still claimed a co-championship in the Southwestern Conference, a coach of the year award and managed to land some guy named LaDainian Tomlinson. He was at UAB when he found out about the cancer. Even this, he said was God putting him where he needed to be. Without the treatment he received at UAB Sullivan believes he might not be here today. This isn’t a misty eyed sentiment, simply a statement of fact. And so in the many twists and turns that can come to a college coach and his family, these seem like good ones. For more than a few reasons Sullivan says he believes he’s right where he’s supposed to be. His wife, Jean, is also from Birmingham. Half of their grandchildren are here. The rest are not too far away, in Mississippi. His goals are here, too. Sullivan looks at his career through those relationships he’s cultivated along the way. His Heisman Trophy experience was no different. Back in those days the announcement came as a halftime feature during the Georgia-Georgia Tech game. Instead of being on the front row in New York, Sullivan was in Auburn. “We were actually at practice that day because we had Alabama on Saturday. My parents had come down to hear the announcement … Our TV went on the blink so we had to go rent a room at the Heart of Auburn. We watched it on TV just like everybody else,” Sullivan said. Sullivan, perhaps the last Heisman Trophy winner to stay at the Heart of Auburn, says his room number has been lost to history. There are plenty of clear memories from the night, though. There’s often that theme of humility, the notion of shared success when you ask Pat Sullivan to talk about his career. He is eager to spread the credit. Even that new statue of his likeness outside the stadium, he says, is just as much for his contemporaries as anyone. To him, seeing the famous seven jersey as a sculpture is flattering, but more for family and teammates. “They’ll all take pride in it, and that will be nice,” Sullivan said. For fans from the good old days it was nice to see Pat Sullivan get so much airtime at the Heisman presentation last December. He says he and his wife go for the presentation as often as possible to catch up with his friends in that rarified football fraternity. Being the charter member of the Auburn chapter is nice, too. “Over the years Bo and I have gotten fairly close. I would hope to do the same thing with Cam. [Winning the Heisman] creates a responsibility. I don’t know that you understand that at the time. As time goes on you understand what a platform you can have, if you want to use it,” Sullivan said. Still, that big Heisman ring does draw attention. Samford players have a handful of new faces coaching them this year. Some are familiar to Auburn fans. Antonio Carter ran routes at Alabama from 2000-2004 and he’s now coaching receivers for the Bulldogs. Travis Trickett, the son of former Auburn position coach Rick Trickett, is coaching tight ends and slot receivers. 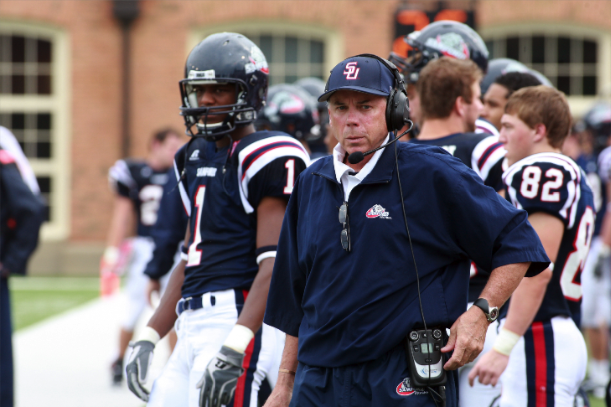 Rory Segrest returned to Samford to coach on the defensive side of the ball. He played at Alabama and has worked in the Philadelphia Eagles organization. The most attention this offseason from Auburn fans came when Sullivan announced his new offensive coordinator, Rhett Lashlee, who learned the game under the professor of high-speed football, Gus Malzahn. “I’m very excited with our staff. There’s a newness and some enthusiasm. I feel very good about our staff and our players. I’m excited about next fall,” Sullivan said. When homecoming rolls around and Auburn hosts Samford, even the stadium announcer might be winded. Lashlee has promised the Bulldogs will have an approach similar to what Auburn has been practicing the last few years. “We started last year with that kind of philosophy. Rhett, with his knowledge as well as some of the other coaches, all of them have bought in. It’s been very good so far,” Sullivan said. Sullivan coached at Auburn during the Dye-era and called games on the Auburn Network prior to that, but this fall will be his first time to see Jordan-Hare from the visitor’s sideline. Time doesn’t stand still, even for the immortals of sport. Even for heroes, there’s a common question. Then that contentment shines through again. “I say it all the time: what you get out of athletics, when it is all said and done, it’s not how many touchdowns you threw, how many tackles you made or bowls you win, but it is the relationships that last a lifetime. That’s what special. To see those guys, to keep up with them, that’s important. That’s what homecomings are for. In a way, he never really left. There’s the Heisman, the retired jersey and the famous picture of Sullivan and Terry Beasley by the big screen. He’s scrambling in a giant banner outside the south end zone of Jordan-Hare. A few years back Auburn honored Sullivan with the Walter Gilbert Award, given to former athletes based on their achievements after their time on campus. Auburn athletics director Jay Jacobs called Sullivan “an iconic figure” who “has been a tremendous ambassador.” You’ll hear that sort of thing about Pat Sullivan if you ask around, but the College Football Hall of Famer simplifies this beyond humility. “Wherever you go basically somebody will stop and associate you with playing ball or what you’re doing now,” Sullivan said. There’s more to that story of what such a man has meant to his alma mater over 40 years, but Sullivan is more interested in the upcoming football season than bragging on himself. In fact, there is a line of players waiting outside his office. They’re laughing, at ease with the end of spring ball, comfortable with their coach. They, too, see a man who enjoys his sense of place. Top photo courtesy Auburn University; bottom photo by Caroline Summers, courtesy Samford University.